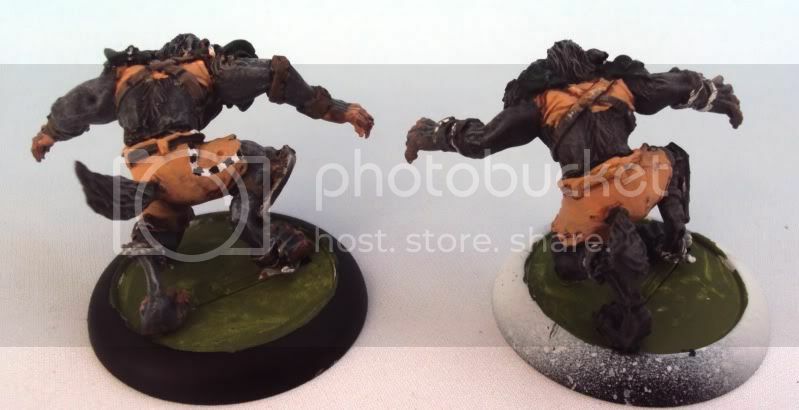 After playing a couple of matches on the computer game with a Norse team I realise I'm going to need throwers. So there will have to be some revamps of the Werewolf team. I decided to use the catchers more aggressively and use my previous Blitzer models for Catchers instead. The Impact Timberline elves will instead become my throwers, which leaves me without any Blitzers! 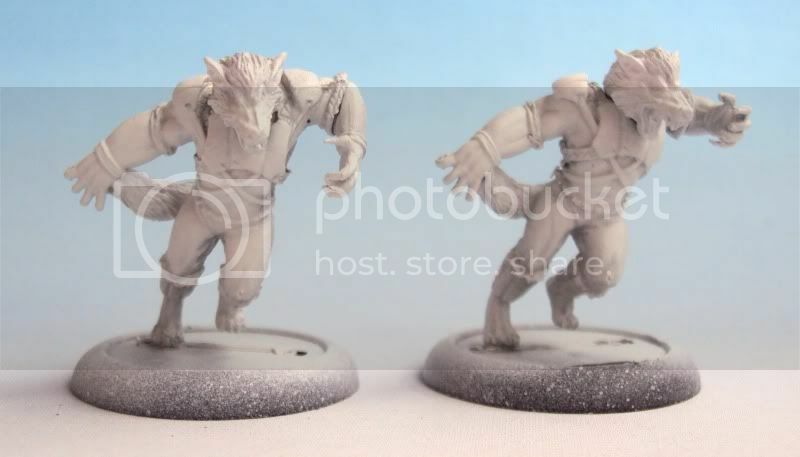 I figured I'd just get another Otherworld Werewolf and use the pair of them as Blitzers, and I think that will work out really well. 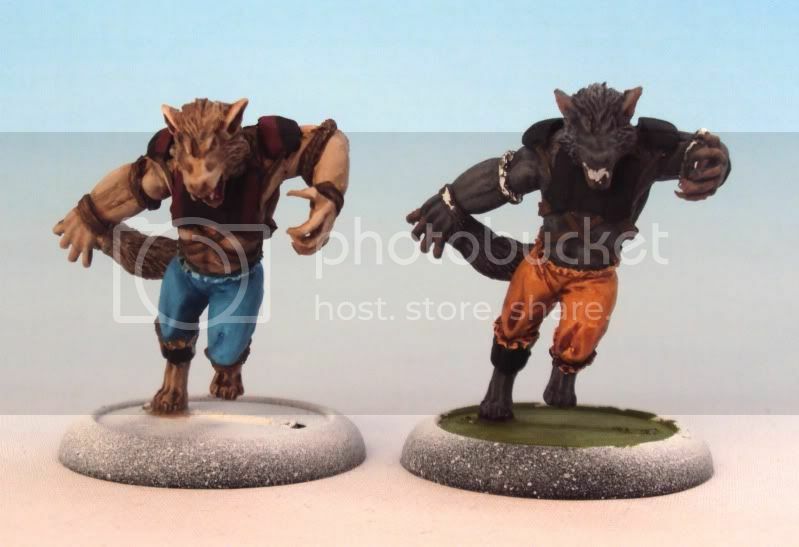 Both the Great werewolf and the Blitzer are frenzied madmen and the models really portrait this. Next update on the werewolves will come when I get the last model. Then it will be finished fast. This project started many months ago with me wanting to try out the new Skaven models. 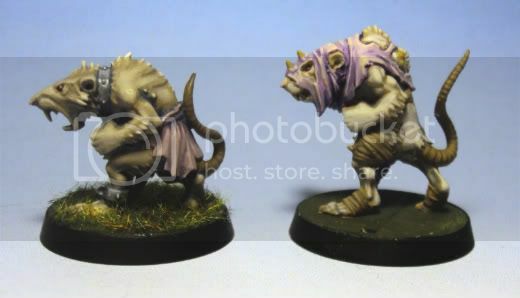 I just loved what Games Workshop had done to their Clanrats, going from the most horrible miniatures in their range to the coolest. 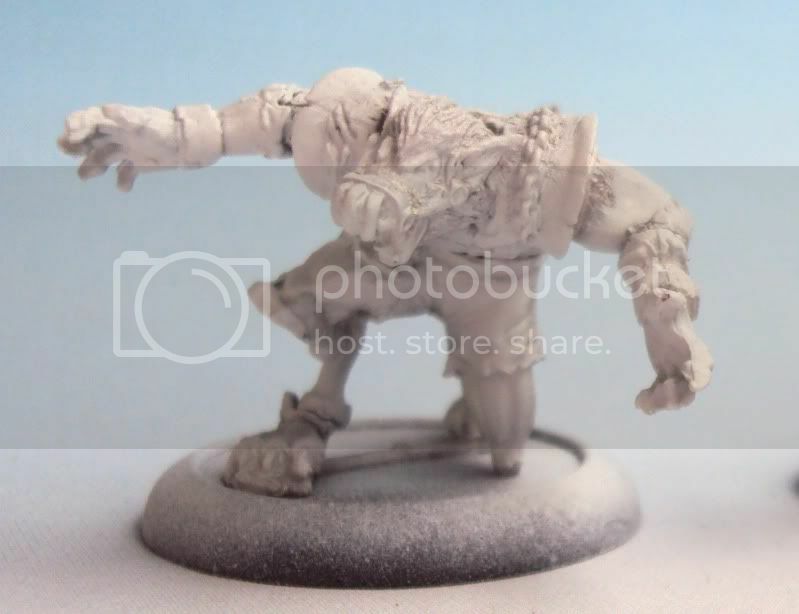 After getting the 20 individual Clanrat models I realised that it would be hard to adapt them to Fantasy Football, since the whole body was one single piece together with one arm. That didn't leave much room for varied poses. To overcome this uniformity and still distinguish between different positionals on a team I studied the 20 different bodies closely to see how I could group them. A few had a lot of armour so they would be blitzers. Others had a lot of clothing and would become throwers. The last ones had practically nothing on and they would be my favourites, the linemen! Next part I will go through how I recently continued with this project that started many months ago. Hi again! It's time for more Werewolves! First up is two colour scheme tests. I went for the grey fur, green armour and light brown clothes. My first idea was to paint each wolf a different colour, taken from Twilight's Quileute werewolf pack. In the end I opted for using only three different fur colours. Two would be for the big werewolves and the rest would get dark grey. These shots from the back show the colour scheme better. My main problem with the linemen is that now that they all have the same fur they will be very uniform. I'm considering using stripes on their pants to differentiate between them a bit. This big guy was actually bigger than I thought. 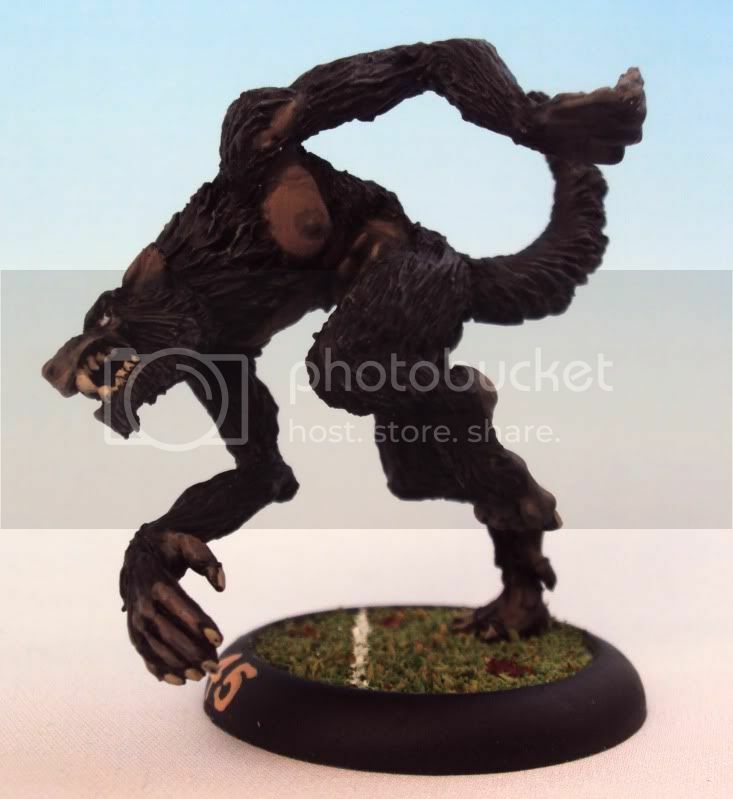 My first plan was to use one of these and then the Otherworld werewolf to get two different Great Werewolves, but this one is too big and the other is too small so I'll have to use two of these Heresy Werewolves. This black one is Sam, the Alpha male. Next one will be Jacob, the other Alpha. The new guy got some brown fur mostly for testing it out. I don't think he will be used much in this team, but I am considering getting another one to use somehow, perhaps in an undead team. So as you can see on the Great Werewolf, I chose to go with the same bases as the Soldiers of Fortune had. I like the look and it's easy to do. But this team is mostly painting from now on. I have already sculpted a longer nozzle on the catchers hood and fixed some small stuff in joints and so on. OK, work has been done and here are the results! The team is finished, except for the bases, as you can see. I just couldn't decide what to do with them. I decided to wait with the basing until it's time to use the team. I'm really looking forward to playing them. More Werewolves! A few more are assembled and I've basecoated half of them. This Werewolf team will have four different kinds of werewolf. Linemen, Blitzers, Catchers and Blockers. 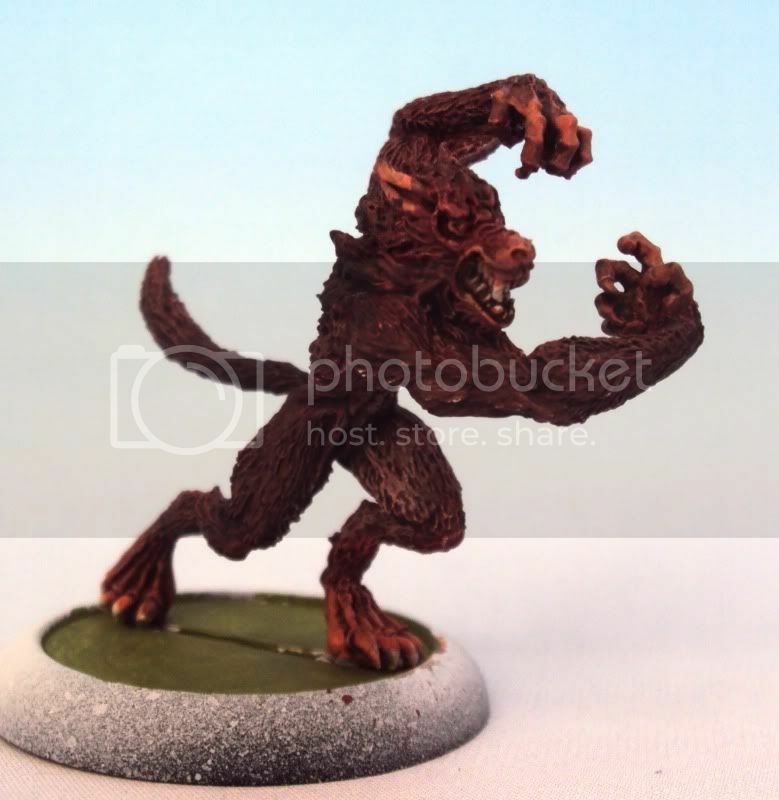 I'm considering adding a Great Werewolf if I can find the funding for the miniature. These guys are one of the more "human" kinds of werewolf. They specialize on hunting down opposing Quarterbacks and are the masterminds of the defense squad. The Linemen on this Werewolf team are excellent blockers. They are more wolf than man and the more experienced linemen have been known to pull down much bigger opponents. Next up is the first layers of paint! I'm going to have to learn how to do good looking fur, so the Rookie will be my testmodel. Hopefully the Blockers will arrive soon so I can start putting them together. Hi, everyone! This is a project I have been looking forward to a long time now. 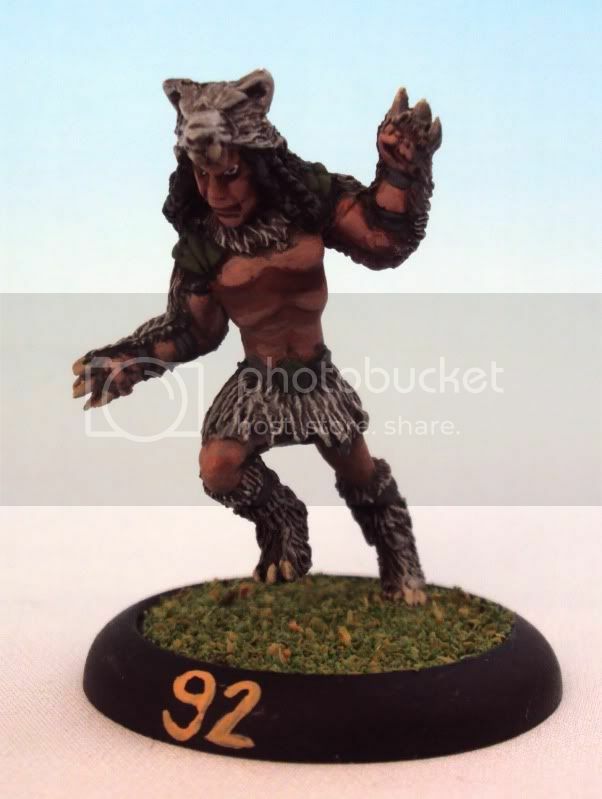 I realised I wanted to do this when I was browsing some fantasy football miniatures sites simultaneously and happened to be looking at Impacts Timberline Elves at the same time as Roll Jordans Necro wolves. Native americans and werewolves, now where have I heard of that before? 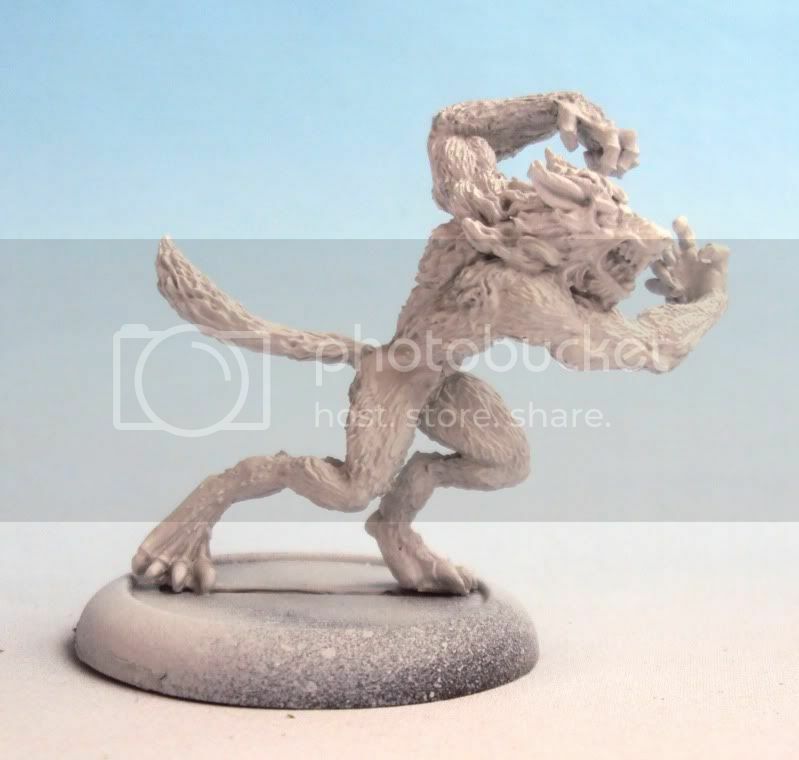 I ordered some models after having checked out all the werewolf miniatures I could find. Here's the first I built! The middle and right ones are Roll Jordan Necro Wolfs, while the leftmost one is from Otherworld miniatures. 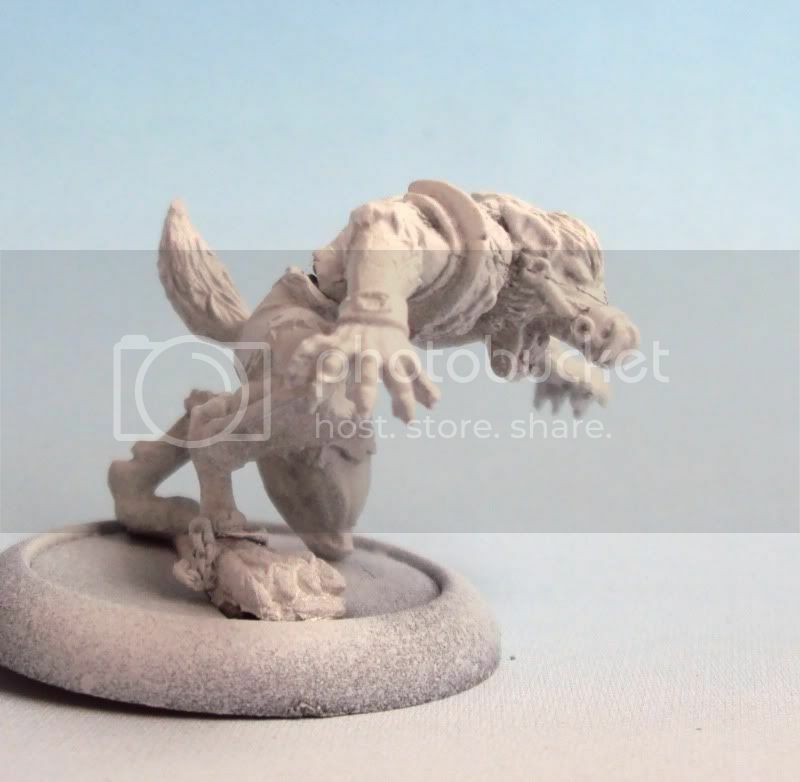 They are all really good miniatures, but I found that the Otherworld wolf had a big advantage: It is a one-part miniature, while the middle Roll Jordan wolf consists of 6(!) parts. On the other hand, the RJ wolves are perfect for fantasy football. Next time I'll go through my thoughts on how the team is going to be put together. Until then I give you the team name: Jake's Wolves! 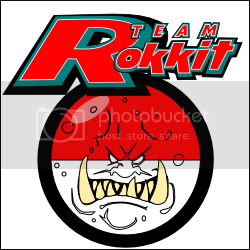 Painting of Team Rokkit continues! As you can see I'm experimenting with funny logos as well. So first off is some progress on the Blockers. Nothing is really finished but they have their base coats at least. Next is highlighting and shadowing the armour, followed by finishing their skin and then adding details like colourfull wires and player numbers. 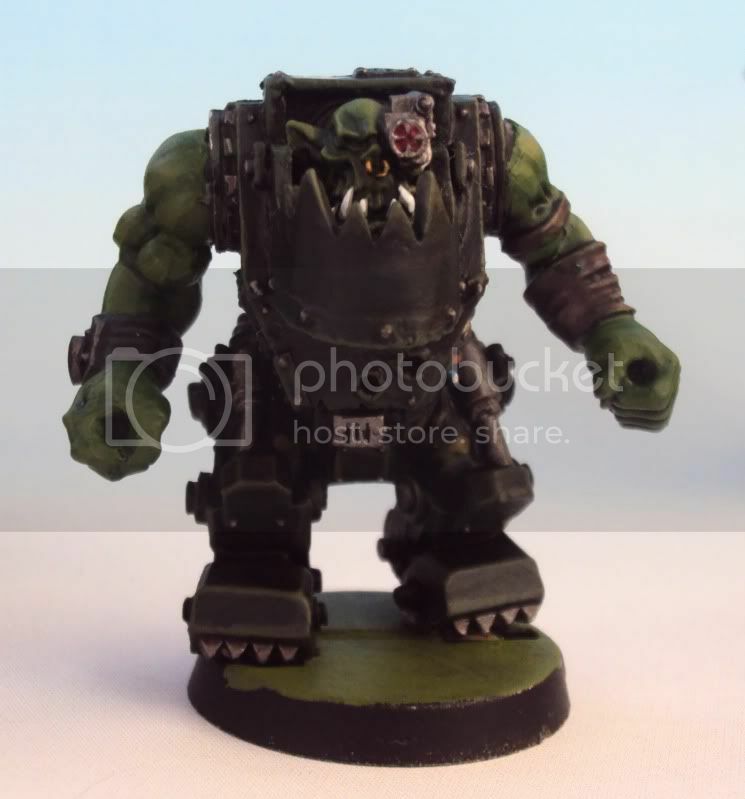 The Blitzers are the most finished and has been since the beginning and as such they haven't gotten much attention yet, but below you can see the Linemen. They pretty much only have details left before they are ready for basing. Basing is a big question for this team. 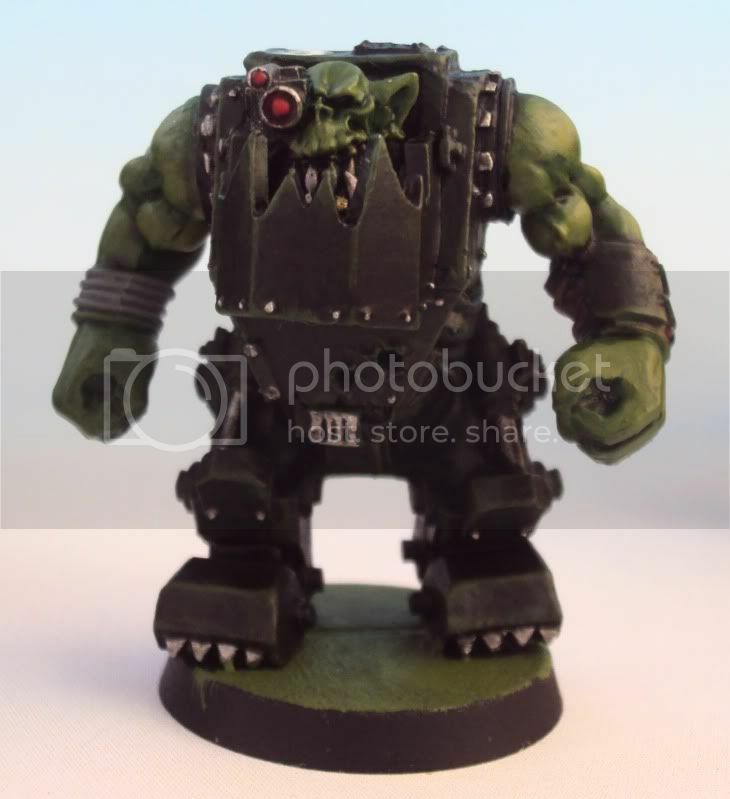 They shouldn't have the clean easy pitch grass of the Soldiers, but they do need something to tie them stronger to Fantasy Football and away from the 40k universe they are taken from. I am strongly considering a kind of Gorkamorka desert pitch but I'm really unsure how that would look. I guess I'm going to have to make some tests!